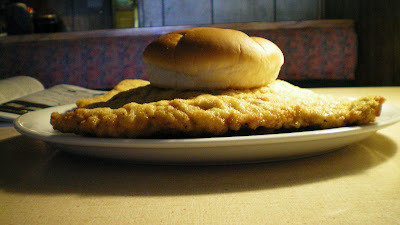 Making the trek to St. Olaf is like a pilgrimage for the faithful followers of the Breaded Pork Tenderloin. 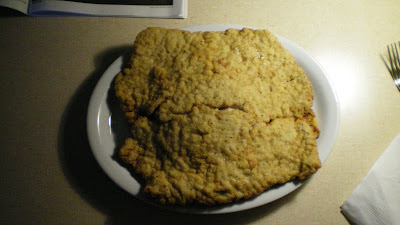 The biggest tenderloin in Iowa is not easy to find, but its light breading texture makes it easy to eat. Driving through the bluff country of northeast Iowa is like driving through another country, you can't see the next town from 10 miles away. You won't want to miss this sandwich. Edit for Spring 2011, New owners and name, check out updated blog entry HERE. 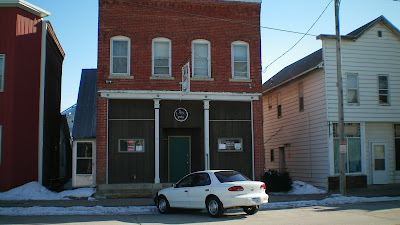 Location: 106 S Main Street in St. Olaf (population 136), in Clayton County, in the northeast corner of Iowa. Directions: Take State Highway 13 or Gunder Rd from Elkader in the south, or Postville to the north. 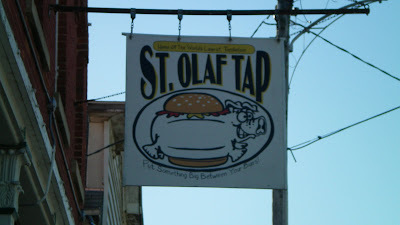 The St. Olaf Tap is the only place open for business in the nearly abandoned main street. Gunder Road also leads to the legendary Gunder Burger in an unincorporated township to the north. The Tenderloin: This was what I had been looking for so long. Its sixteen ounces of tenderized pork. 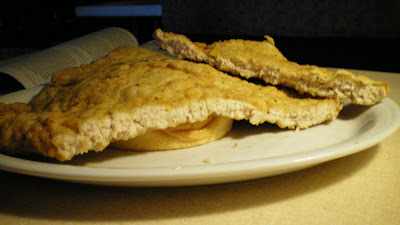 The breading is light and stays on the meat. 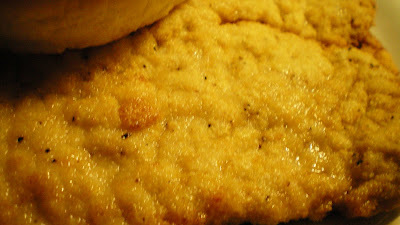 The moisture of the meat moves into the breading to make it stick and shine. There is a pinch of pepper that does more for the visual appeal in the close-up than anything else. The meat was especially white and well-cooked. The most impressive thing is the great job of trimming the huge cut of pork. There was almost no fat to chew on in the pound of meat. Overall this is the least filling of all the super-jumbo tenderloins. The lightness makes it easy to get through, with little gastro-intestinal disturbance that other tenderloins bring. Overall 9.2 out of 10. I had to finish it in my car, but I did finish the whole thing in about 20 minutes. Price: $9.95 for the 16 oz., also available in 8 oz. and 4 oz. sizes. Also on the Menu: Fried chicken, burgers, sweet potato fries and other bar food favorites. Service: One person in denim overalls worked the bar, waited tables, and cooked. This isn't difficult when only one person is here. Jim made conversation and described St. Olaf as a "dying town". He claimed the tenderloin was cut, tenderized, and breaded just a few hours earlier by a eighty year-old man who had been doing it for decades. Ambiance: The bar area has a TV playing at loud volume. There are booths and tables for seating. The dim light made photos difficult, I was the only person there on a snowy day. The walls are covered with normal pub and grub junk, you can purchase t-shirts with the St. Olaf Tap logo from the sign. Lights dimmed to save on electric bills meant that my pictures didn't turn out as good as the should have, the sandwich looks better in person. Final Thoughts: Finding the biggest tenderloin was like spotting a Yeti while trekking through Iowa's version of the Himalayan Mountains. The town is hidden, the road is less-traveled, and maybe St. Olaf will disappear from the map someday. But this tenderloin is the biggest you will find anywhere in Iowa, bar none.